Chanel? Louis Vuitton? Trip to NYC? If you’re thinking ‘yes please!’ then Luxe Luck is for you. It’s simple – www.luxeluck.com is a luxury prize competition website. You sign up and play for luxury items and experience and we provide the prizes to the lucky winners. Visit our website and chose what you want to play for and select the ticket numbers you want and add to cart. Depending on the prize, there will be between 100 -2000 tickets available. You can play a maximum of 10 tickets per prize until the competition closes. You can add other prizes to your cart, or you can go straight to answer the brain tangler –just one correct answer secures all entries once you’ve checked out. The live draw is activated once all tickets are sold out or timer ends, whichever comes first. Some of our draws will be drawn live (for example at our stand at Olympia Beauty) and some will simply take place using a generator which shuffles all entries, making sure the draw is completely random and picks the winner(s). 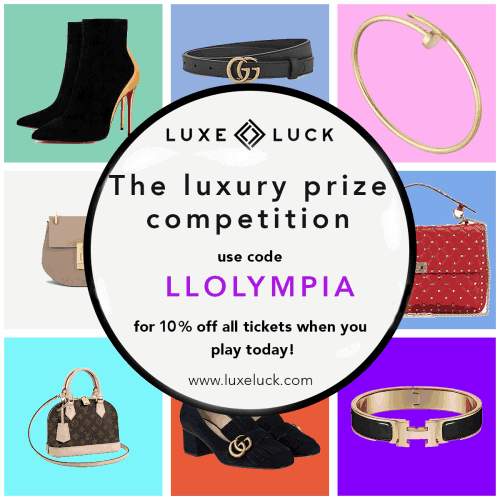 Olympia Beauty attendees can claim a 10% discount on all entries by using code LLOLYMPIA – play now to win any or all of the following: £1,000 Louboutin gift card, Chanel classic bag, a 5* trip to NYC and Louis Vuitton Alma BB. We are firm believers in giving back and our most recent winner selected the Alzheimer’s Society to receive the latest Luxe Luck charitable donation. More details on how to enter and how the process works can be found here. To keep up to date on the prizes to play for, sign up here and follow us on Instagram. Visit our website for full terms.